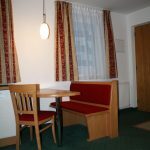 Situated right in the St.Anton village centre we have a very nice modern 30 sq m studio apartment. So if you want to be seconds from the famous St.Anton night life then it will be perfect for you. 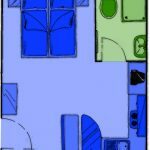 The studio will sleep 2 people and has unlimited wireless internet and HDMI Smart TV also with the local cable TV. 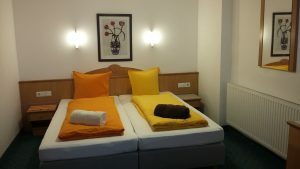 The beds can be arranged as either a double or two singles. Indoor car parking is also available in a secure garage close to the studio. 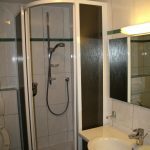 The bathroom is fitted with a shower, toilet & wash basin. 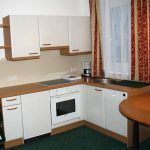 The studio has a kitchen that is fitted with a dishwasher, oven & hob and a fridge as well as all the utensils that you need to cook whilst on staying here in St.Anton. The studio is located in one of the very best positions in town, right in the middle of the pedestrian area so you will struggle to find a better position. You will be seconds from the bars, restaurants and nightlife that St.Anton has to offer. It is just a short walk of about 1 minute to the slopes and all three of the main ski lifts. The supermarket is also just a few metres away. Because of the position and price these studio’s are in great demand so early booking is recommended to avoid disappointment.